July's residential housing sales in Metro Vancouver* reached their lowest levels for that month since the year 2000. Last month's sales were 29.3 per cent below the 10-year July sales average. 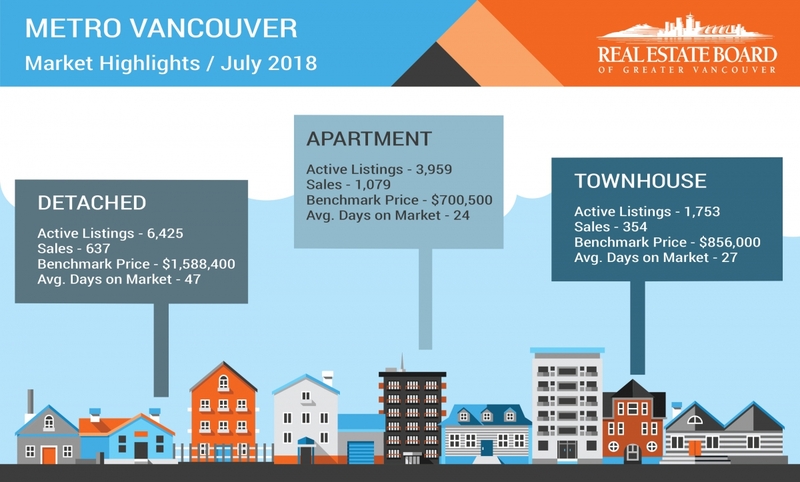 "With fewer buyers active in today's market, we're seeing less upward pressure on home prices across the region," Phil Moore, REBGV president said. "This is most pronounced in the detached home market, but demand in the townhome and apartment markets is also relenting from the more frenetic pace experienced over the last few years." "Summer is traditionally a quieter time of year in real estate. This is particularly true this year," Moore said. "With increased mortgage rates and stricter lending requirements, buyers and sellers are opting to take a wait-and-see approach for the time being." *Note: Areas covered by the Real Estate Board of Greater Vancouver include: Whistler, Sunshine Coast, Squamish, West Vancouver, North Vancouver, Vancouver, Burnaby, New Westminster, Richmond, Port Moody, Port Coquitlam, Coquitlam, Pitt Meadows, Maple Ridge, and South Delta. The real estate industry is a key economic driver in British Columbia. In 2017, 35,993 homes changed ownership in the Board's area, generating $2.4 billion in economic spin-off activity and an estimated 17,600 jobs. The total dollar value of residential sales transacted through the MLS® system in Greater Vancouver totalled $37 billion in 2017. The Real Estate Board of Greater Vancouver is an association representing more than 14,000 REALTORS® and their companies. The Board provides a variety of member services, including the Multiple Listing Service®.